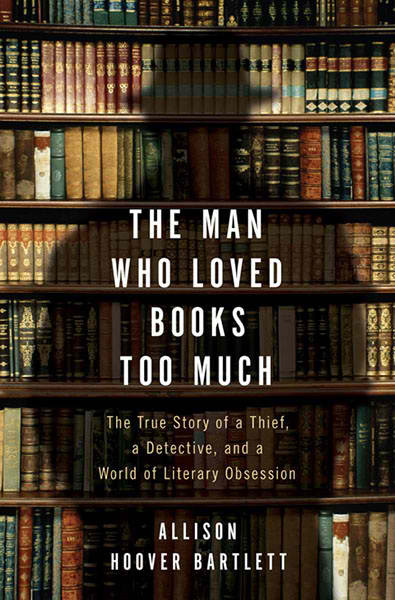 Journalist Allison Hoover Bartlett presents a captivating combination of true crime and the art of antique book collecting in her debut book The Man Who Loved Books Too Much . After an intriguing introduction in which she shares her own personal experience with an alleged stolen, centuries-old German book, Bartlett gives us insight into the antiquarian book world and the bibliophilic thieves that threaten the business. More specifically, Bartlett delves into the world of book-dealer turned detective Ken Sanders and his quest to apprehend notorious book thief John Gilkey. Not only does Bartlett interview Gilkey in prison, but upon his release she personally accompanies him on his "shopping expeditions" to antiquarian book stores. In one of the most interesting, engaging and page-turning true crime books I've ever read, Bartlett dissects the dark side of the book-dealing business. I candidly admit, The Man Who Loved Books Too Much is the ONLY book in the bibliophilic antiquarian sub-genre (ha!) that I've ever sincerely been captivated by and read completely all the way through. Of the books I've read recently, Library: An Unquiet History by Matthew Battles (review here: Dreamworld Book Reviews: Library by Matthew Battles) is not as attention-grabbing as this particular book given its minutely-detailed narrative. Bartlett's style is easy to relate to and non-condescending, making for an immensely enjoyable read and also a book you can recommend to any audience. I loved learning about specifics on what to look for when visiting antique stores and bookshops, as well as signs of what to look for when seeking out very specific first-editions; such as Dr. Suess' The Cat in the Hat . I find it extremely interesting that a man like Gilkey is able to escape conviction due to the fact he commits his crimes in several different states, making it difficult for jurisdiction. Obviously, book people are still thrown to the wayside when it comes to importance and precedence, as always! 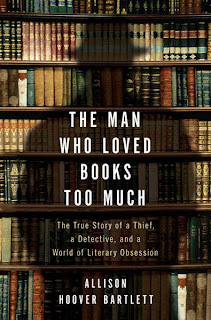 I definitely recommend The Man Who Loved Books Too Much to any reader who loves learning about book collecting, the value of books and of course, tales of true crime.